A range-restricted (EOO 51 km²), but locally common taxon that is not threatened. Shallow grit pans on gneiss. There are no significant threats to this taxon. This range-restricted taxon is known from three subpopulations. It is however locally abundant and subpopulations are large. The population is estimated to number at least 5000 individuals and is not declining. Smale, T. 2000. 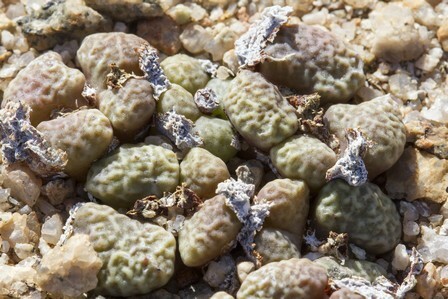 Conophytum roodiae and its relatives. British Cactus and Succulent Journal 18(2):101-107.